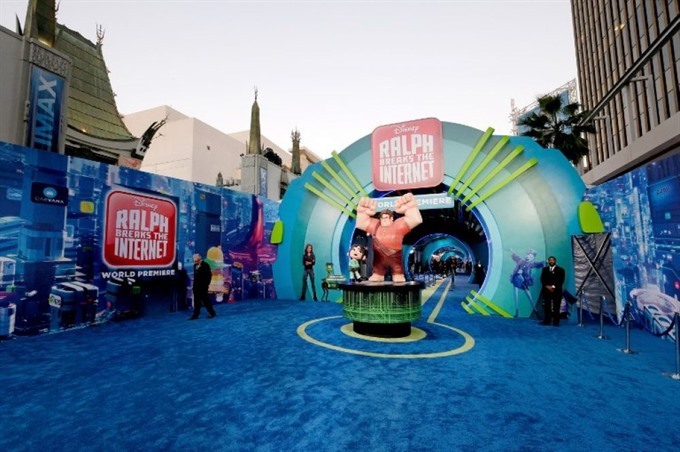 LOS ANGELES — Disney animation Ralph Breaks the Internet held the top spot in North American theaters for a second straight weekend, taking in US$25.6 million, industry tracker Exhibitor Relations reported Monday. The sequel to 2012’s Wreck It Ralph sees the title character (voiced by John C. Reilly) and friend Vanellope von Schweetz (Sarah Silverman) venturen into the weird world of the internet, with predictably screwy results. The Grinch, Universal’s family-friendly feature about the not-so-friendly green creature from Dr. Seuss’s manic menagerie, placed second, with US$17.9 million for the three-day weekend and a cumulative domestic total of $203.7 million. Benedict Cumberbatch voices the irritable title character. In third was MGM’s boxing drama Creed II, with a take of $16.6 million. This latest episode in the "Rocky" series stars Michael B. Jordan as Adonis Creed as he takes on the son of the boxer who killed his father. Sylvester Stallone, of course, plays aging ex-champ Rocky Balboa, now a restaurant owner and Adonis’s mentor. Holding in fourth place was Fantastic Beasts: The Crimes of Grindelwald from Warner Bros., at $11.4 million, pushing its worldwide total past $500 million. The Harry Potter prequel stars Eddie Redmayne as Newt Scamander; also starring are Jude Law and Johnny Depp. Placing fifth, and in its fifth week out, was Fox’s Bohemian Rhapsody, with $8 million. Rami Malek plays rock group Queen’s talented front man Freddie Mercury.